Prompt: The meta for this puzzle is a famous jazz piece. I don’t know much jazz, so I began by Googling a list of greatest jazz pieces of all time. The #1 piece was “Take Five,” which seemed suggestive for meta use. So did a couple of others like “Take the A Train,” though, so went ahead with the solve armed with a few possible answers. The fill and black square pattern strongly suggested some kind of meta-pattern appearing in the grid as opposed to something theme entry-related. The longest entries are a pair of 11s, followed by a bunch of 8s, so there’s probably not a set of four theme entries hiding in that woodpile. Plus the fill is rough enough in places to suggest there was a lot of stress on it (EFOR in particular I was sure had to be there for a reason, which turned out to be true). Starting with the usual: 1) free-scan for a minute or two, see if anything jumps out; 2) go over the clues one by one, looking for any subtle hint I might have missed, or something unsubtle like an asterisk, 3) more organized version of 1), looking at letter frequencies, scanning diagonals, etc. That search yielded…not much. For about 15 minutes I tested the hypothesis that the title “Piano Pieces” meant I should circle all the instances of P, I, A, N, and O in the grid, which I did, first connecting all the Ps, then all the Is, and so on. The first few letters were each just promising enough to make me go on to the next letter, but after the N’s my “treasure map” looked ridiculous so I realized it was time to move on. Then I decided to look where the fill was most strained. When I started thinking along those lines my eyes were drawn to the upper-right and lower-left: why did he need those three black squares in each of those corners? Scanning those, I noticed the name “Kimball” comprised of the entries KIM and BALL. Its mirror image in the NE read BALD/WIN, so this was unlikely to be a false trail. Googling those two names together I discovered they are famous brands of piano, which sounded familiar once I read it. I’ve probably seen a lot of Kimball and Baldwin pianos, but the famous company I knew offhand was Steinway — and there it is, STEIN/WAY at 25- and 40-Across. 99%+ chance this is the right path now. Don’t know any other famous piano companies but Google does, Google knows everything, and it tells me about the Yamaha and then Boston companies, which are in the grid symmetrically as YAM/AHA and BOS/TON. Now I got stuck. These five pianos seemed to suggest “Take Five,” but beyond the “fives” what else is there? The piece features one piano, not five, and what would “take” have to do with anything? With time running out I crossed my fingers and submitted “Take 5,” about 70% sure it was correct. 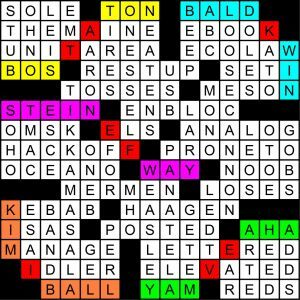 It was, and the puzzle’s author told me what I’d missed: if you take the letters connecting the two pieces of each piano, they spell out, in grid order, contest answer TA/K/EF/I/VE, in red in the solution grid at right. That’s an outstanding meta, and this is now may favorite installment of the series this year, displacing November’s masterpiece. The piano pieces stick out just enough for the solver to find them after a search, and the solver is sure they’re on the right path after the pianos appear. But then what? The last step of connecting the piano pieces is so logical and simple, but elusive as well, and then painfully obvious in retrospect. That’s how it’s done! He really ended 2018 with a couple of towering home runs. 4.87 stars — this is a beautiful and unique idea whose potential Pete maximized. I bet this one took quite a while to orchestrate. This entry was posted in Daily Puzzles and tagged Muller Monthly Music Meta, Pete Muller. Bookmark the permalink. Was never even close and guessed the right answer. I bet I’m not alone. Yeah, I didn’t call one in but that would have been my wild guess too. 112 correct this month (maybe a handful of self-admitted guessers). The final puzzle of the year, the mega-meta reveal, comes out the last Tuesday of the year (December 25 this year!). This is the puzzle where you get to figure out the mega-meta if you’re not one of the 26 solvers who already cracked it. (It’ll be a fun solve even if you have). I’m still deciding on the format of the 2019 MMMM, but there will be something fun happening. I missed the connecting letters but felt with five pianos what else could it be? I did spend some time with the symmetrical LOSES ELS, looking for that extra Mullerism. So glad to see that it was there all along! This came to me quickly, maybe because I play piano. I have a Baldwin and I learned on my grandmother’s Steinway. Once enough connecting letters emerged, it was easy to see TAKEFIVE, one of my favorite jazz pieces and an apt answer. My only nit is that BOSTON is a less expensive model in the STEINWAY line. But it’s easy to understand why Pete used it, as the choices for brands of the right length that break into two entries are very limited. Over all, I enjoyed this one very much. I had an edge on this one — I am married to a piano player and we’ve shopped for pianos together. Also one of his favorite candy bars is Take 5! It didn’t take long for the piano pieces to come into focus. Boston was the only one I had to confirm. Noticing the proximity of the pieces that went together made me want to connect them with a line, which crossed very few letters, and then was able to unscramble the solution. Enjoyed it very much! The only disappointing thing is that people apparently can guess it without actually solving. I loved this puzzle! It hadn’t occurred to me though that this would be easy to guess – with or without the five pianos. I’m trying to decide if that’s a flaw, and if so how much. I have Guitar Center radio commercials to thank for this one, as that’s why I’m familiar with Boston, Baldwin and Kimball. I also didn’t immediately see that last step, and when I finally did, it was sooo satisfying. 5 stars from me! I liked this tough one very much. I also tried the P’s, I’s, A’s, N’s, and O’s. and with bald/win and kim/ball, and the loopy way I marked them on my printout, it looked like a large “S”, so .. Giant S(teps)? the middle does kind of look like that. Big S(pender) ? Maybe something about the first clue + the symmetrical entries to Steinway? So I decided to recolor my grid, neater, and there were too many pieces to show who goes with what (in the few colors I had), so I was going to color the connections … Boom!